Wow!!! I went to Get Knitted on the outskirts of Bristol today with my mum (another knitter) and it was heaven in the form of a shop. The directions on their website were great, really easy to follow and led me straight to the carpark behind the shop. When I walked in I was astounded by how big it is and how much yarn there is. I should really have figured it out from the list of yarns available on the website for mail order but I’d never been in a yarn shop that wasn’t tiny and cramped with yarn on every available wall/surface. It’s spacious and well laid out with a pink sofa area for their monthly knitting group or for sitting down and having a cup of tea/coffee while you decide which yarn/pattern to buy, and there’s a kids play area stocked with toys and books. The staff were friendly and extremely helpful, I wanted advice on sock yarn that wouldn’t make me itchy and they had about 3 or 4 choices. 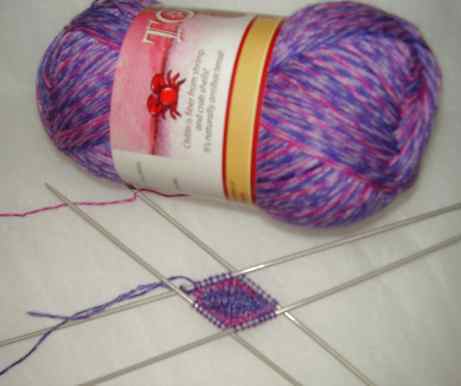 I bought a ball of Tofutsies sock yarn by South West Trading Company which is made of Soysilk, Wool, Cotton and Chitin (fiber from shrimp and crab shells. Naturally antibacterial) in shade 726 “One Foot In Front Of The Other” which is pink/purple and a ball of Lana Grossa Cotton Spirit in shade 3006 which is green/blue/turquoise. For my friends impending babies I bought The Second Little Sublime Hand Knit Book because the patterns are sooooooooo cute and there are more garments that I like in it than any of the Debbie Bliss books. I also bought 4 balls of Debbie Bliss Rialto in a bright red for a boy/girl sweater/cardigan – delete as appropriate when the baby is born and I have made up my mind. Then I bought a ball of brown Rialto and cream Rialto so I can use them with a bit of the red to knit a baby hat like a Christmas Pudding. If there’s enough yarn I may knit two. And just because I could, I bought a pair of 4mm Brittany Birch Hardwood straight needles as my metal ones (borrowed permanently from my mum) aren’t very pointy anymore. After spending 2 hours in Get Knitted we got back in the car and headed to Bath for lunch and a bit more shopping where I bought some fun Monstarz stickers from Paperchase which are in the top right of the Get Knitted bag above, a magazine and a bag of green threads for embellishing things and a serving spoon for my kitchen! All in all it was a really nice day off and much better than being in the office. It turns out that I don’t have any 2.25mm or 2.75mm dpns so this is the Tofutsie yarn knitted in the magic cast on toe on 2mm dpns so I could see what it would look like. 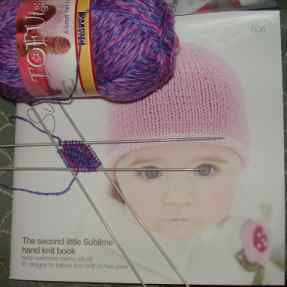 Oh and I remembered to buy another ball of Sirdar Snuggly Baby Bamboo so I can finish my Tequila Sunrise jumper. As it was payday and I’ve got two days off next week I treated myself to a haircut after work yesterday. Was really nice and relaxing having my hair washed and cut after a very stinky week in the office. Here are some photos of my Tequila Sunrise sleeves, one finished and one almost finished. There’s a small chance that I may be able to post a picture of the finished object next weekend as long as I can get another ball of yarn on Monday at Get Knitted. 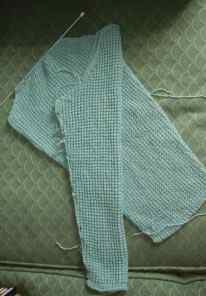 We’ll see, it may take a bit longer as this is my first garment that I have to block and sew together. I haven’t done any other knitting this week but I have been thinking about a lilac cotton summer top that I knitted a while ago. It’s a kind of diamond shape and you sew it up in a tube with the seam on the diagonal – like when you unroll a cardboard tube. But having pinned it together and tried it on the tube is very long in the body and I’m not!! I don’t love it either, it’s one of those projects that by the time you’ve knitted it you end up not liking it and a bit disappointed. I also don’t think the shape will suit me at all. I’ve got two choices I can either a) sew it up and then sew up the ends and make a tube shaped knitted pillow/cushion or b) frog it and use the yarn, which I still like, to make another little summer top – maybe a vest (tanktop in American!) or something. Quick post but I wanted to say that I’ve finished one sleeve and almost finished the second on tequila sunrise. 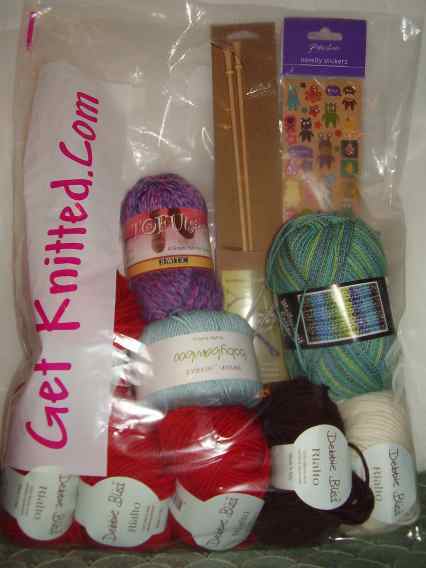 As predicted I ran out of yarn so I will need to buy another ball on Monday at Get Knitted. But I’m very proud of myself for persevering and getting that far. I finished reading “the book” but won’t say any more than it’s good and I liked it. I’ve started reading it again so I can take it all in properly. Hopefully going to see Order of The Phoenix on Wednesday evening. This week has been quite a productive knitting week, the complete opposite of the week before. I think it’s because of Pixe from www.pixiepurls.com as I went for a walk last Sunday to get some exercise and decided to listen to one of her podcasts as I walked. In it she was talking about how she hates knitting sleeves and I completely agree. It made me determined to finish the sleeves for Tequila Sunrise so that I can start knitting baby things without another UFO making me feel guilty. So I’ve knitted a few rows at least every day, even this morning when I had the new Harry Potter book tempting me away. I’ve knitted to the shoulders, remember I’m doing both sleeves together using a ball of yarn each, and the next row is the beginning of casting off stitches to create the shaping to attach to the arm hole. I’m a little concerned as I’m using the last two balls of yarn and I’ve got to finish the sleeves and knit about 4 rows round the entire neck after joining the shoulders together. If I do run out of yarn it won’t be a complete crisis as I can either get the yarn shop in Wells to send me another ball or I may be able to get some at www.getknitted.com as I’m going to their shop in Bristol next Monday. I’m very excited, Salisbury doesn’t have a very good yarn shop, we have a craft shop that sells yarn too but that’s all. I’m going to treat myself to some Noro Kureyon to knit a felt baby beanie from a pattern on www.erssieknits.com , some wool to knit a baby cardigan probably from a Debbie Bliss pattern, some sock yarn as I haven’t knitted socks for awhile and I do prefer knitting in the round on dpns for some reason, maybe a magazine and/or a book. I’m also looking forward to it as it’ll be a day off work, yay! This week at work has felt like about 9 days instead of 5. Consequentially I haven’t knitted a stitch since last weekend. I have just looked in my back issues of Simply Knitting (British knitting magazine) for baby patterns as I have 3 friends who are pregnant and due at the end of the year. I have found a couple of cute beanie patterns, one like a christmas pudding ;o) and a very plain jacket that depending on the colours would be nice for either a boy or a girl. But as there are three impending babies and one that’s just happened I may try to find a nice book of baby knits. And I’ve had a request for mitten with string between them so they don’t get lost. I did manage to eat healthily this week and didn’t have a single cup of tea or chocomilk (we have a drinks machine at work – ick) until today. I ate my 5 portions of fruit/veg every day and drank tonnes of water. But I think mostly due to work being so tiring and just having too much to do I didn’t really feel the benefit. So I will try again this week. 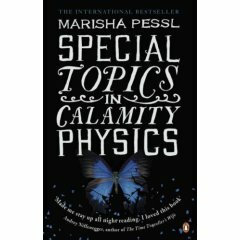 I did read Special Topics In Calamity Physics by Marisha Pessl, mainly because I was attracted to the cover, the main character’s name (Blue Van Meer) and it had physics in the title. I did read it quite quickly as it’s not a small book but I didn’t love it. I wouldn’t read it again. Looking on Amazon.co.uk it says that other people bought The Emperor’s Children and I didn’t really enjoy that either. Blue is a teenage girl who has spent most of her life since her mother died travelling all over America with her father who is a college lecturer. They settle down for her senior year and Blue becomes friends with a group of people who are known at school as the “bluebloods”. A character dies and Blue decides to investigate to find out what really happened. I don’t really enjoy reading stories about teens and their friendship problems, you know the popular kids bully the unpopular/odd kids. It’s too much like being a teenager again!! It’s also written as if it’s a text book or study guide and whilst it’s quite quirky at the beginning I did get a bit bored of it after a couple of chapters. I’m looking forward to Friday/Saturday as Harry Potter And The Deathly Hallows is being released at midnight. I probably won’t go to a midnight opening as I haven’t preordered it and I can wait until Saturday morning. When book 6 was published I was working for a bookselling company and all I thought about for 7 months was HP6 so it’s been nice to just get excited along with all the other fans this time. The sun came out today! It’s been quite rare in the UK over the last few weeks. There’s been major flooding in many of the northern counties and while we’ve been very lucky in Wiltshire it’s still rained enough to make me think the summer was over. I’ve felt like I’ve had quite a productive weekend. I’ve knitted about 14 rows of the tequila sunrise sleeves, finally put a bunch of old photos in an album I have been meaning to do that for years, finished reading The Emperor’s Children which I have decided I didn’t really like and went for a little bike ride. I’m trying to be more healthy so this week I’m going to try to eat my 5 portions of fruit/veg each day, drink more water and I’m going to try to cycle twice more before the weekend. I will let you know how I get on next week!! I spent most of this week under my duvet as I’ve had a summer cold and so I haven’t done much knitting at all. I did finish the blue/white hat but it’s a bit funny looking, I think it’s something to do with when I did the decreases. I need to have a proper look at it and probably undo some of it to get the shape to be hat like, at the moment the top is more like a tomato or pumpkin! I did knit a few rows of the sleeves from tequila sunrise last night but progress is still slow. I can’t post pictures as my camera batteries are flat so here’s one of the latest addition to my moomin mug collection. The House At Riverton by Kate Morton, a story of the goings on in a family house in Essex in the 1920s told by an elderly lady who was the housemaid who witnessed it, all those years ago. I thought it was really good and felt really immersed in the period. The Savage Garden by Mark Mills, 1958 a student goes to a house in Tuscany to solve the puzzle behind a beautiful garden. I really enjoyed this as it’s set very near Florence, where I went on holiday a couple of years ago so I could really imagine being there. The Emperor’s Children by Claire Messud, New York, three 30-somethings in 2001. I bought this as I thought it was about 1900s New York and I was looking forward to reading a third book set in a different historical period. But the turn of the century it refers to on the jacket’s blurb is 2000 not 1900, oops. I haven’t finished it yet but I have to say I’m not loving it. The characters don’t appeal to me at all but I’ll see how they are affected by 9/11 as I think that’s the point of the book.